A native web rendering engine, WebKit API compatible and drop-in replacement. aims at providing the most popular documented methods of Full WebKit for the classes WebView, WebFrame, WebDataSource, etc. Forms Basic form elements (fieds, buttons) work. Frames Basic Basic frames work. Lists Parsed, displayed, not formatted correctly. Ordered lists do not count. Tables Partially supported only on Cocoa. Formatting is rough. 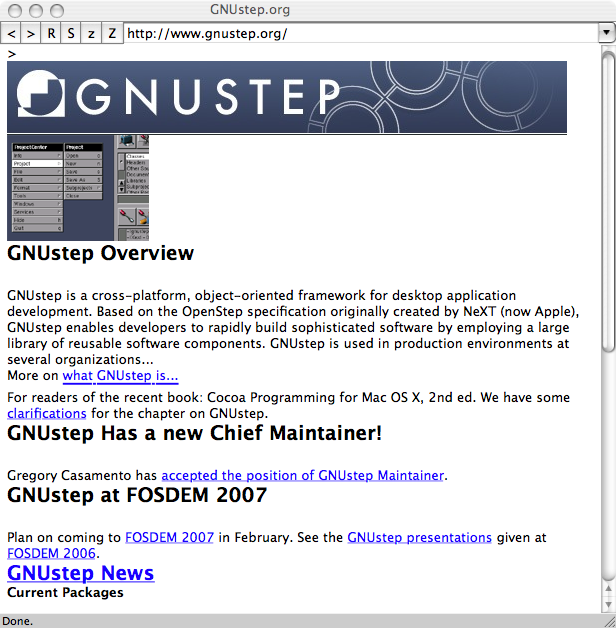 GNUstep and myStep lack support. We have compiled Simple WebKit and SWK Browser with Cocoa so that it runs natively on a Mac. SWK Browser has been ported to GNUstep as well and runs using NIB loading without any additional code change. if one needs layout, it must go to the DOM Tree to find out what has changed and update its size, content, children, layout etc. This page was last modified 09:45, 24 February 2012. This page has been accessed 99,146 times.